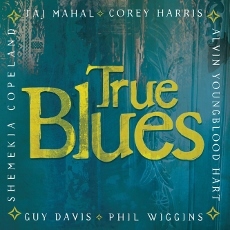 Not since the designation of 2003 as the “Year of the Blues” has the genre been more celebrated than it is on the newTrue Blues CD from Telarc, featuring solo and joint performances from blues greats Taj Mahal, Corey Harris, Guy Davis, Shemekia Copeland, Alvin Youngblood Hart, and harmonica ace Phil Wiggins. Recorded at venues throughout the United States – from Jazz at Lincoln Center in New York City and the House of Blues in Los Angeles, to Washington, D.C.’s Howard Theatre and the Ram’s Head Tavern in Annapolis, the 13-song live set is just one component of a multimedia celebration that also includes an upcoming companion DVD and an ongoing tour that features the same blues men and woman from whom you hear on the CD. It all starts with a creeping take on the Willie Dixon/Muddy Waters classic “Hoochie Coochie Man” that has Guy Davis, Corey Harris, and Alvin Youngblood Hart sharing vocals, accompanied by Phil Wiggins on harmonica. Despite how many hundreds of times you’ve heard this song, we doubt it’s ever been quite as lowdown as this. But truth be told, there’s really not a bad song in the bunch, with Davis also contributing a couple of superb tracks in “Saturday Blues” (Ishman Bracey) and a haunting “That’s No Way to Get Along” (Rev. Robert Wilkins); Wiggins, backed by Hart, offering the country gospel-sounding “Roberta” as well as a short solo instrumental “Prayers and Praises” featuring the bird-like warbling of Wiggins’ harmonica; and Harris delivering the slow and serene “C.C. Pill Blues.” Like many of the songs, this latter track is a bit more on the laidback side, but with lyrics such as “blues and trouble are my two best friends/ when my blues walks out, my trouble come waltzin’ in”, it’s hard to imagine things getting much bluer than this. This entry was posted in Albums and tagged Alvin Youngblood Hart, Corey Harris, Guy Davis, Phil Wiggins, Shemekia Copeland, Taj Mahal. Bookmark the permalink.